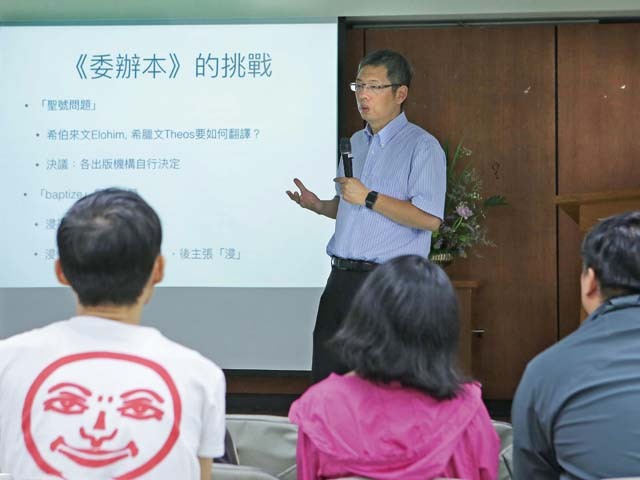 Theology@Sunday, a forum of theological seminar initiated from Taipei, held her first time assembly at Tong-Rong Presbyterian Church at Taichung on October 15. Rev Tsai Ming-wei, a contributing writer for the Study Bible of Chinese Union Version with New Punctuation published by The Bible Society in Taiwan, was specially invited to share his thoughts on the translation stories of Taiwanese Bible from 19th century up to date. Rev Tsai urged the audience to treasure all those missionary services devoted in the translation ministry of Taiwanese Bible, for it is an amazingly unexpected ministry since 1818 by Rev Robert Morrison, who initially intended to preach into China and arrived at Macau in 1807. Due to his entrance into China was unfortunately rejected, Rev Morrison moved to Malacca peninsula at southern Malaysia, where school was set up and printing machines was imported to serve overseas Chinese, who spoke the Amoy dialect, a Chinese Hok-këèn province’s oral language very similar to the Taiwanese language in 19th century. Edited by the pioneering missionary Rev Walter Henry Medhurst, the first ever Romantized Taiwanese dictionary, A Dictionary of the Hok-këèn Dialect of the Chinese language, was first published by London Missionary Society in 1832, said Rev Tsai, adding that the tonal notes created in this historical English-Taiwanese dictionary are still being used today and even applied in the Romantization of Hak-ka and Teochaw language. Regarding the renown “Red Cover” Taiwanese Bible, brutally confiscated by KMT regime in 1975 at Taiwan Church Press, Rev Tsai expressed that many people particularly cherished this Taiwanese Bible due to its rough treatment under KMT’s authoritarian ruling. But, another equally significant meaning, i.e. why this “Red Cover” Taiwanese Bible matters in church history, appeared seldom touched and even overlooked by Taiwan Christians, Rev Tsai said, indicating that this “Red Cover” Taiwanese Bible, initiated from the Catholic Church’s proposal and later invited four PCT biblical scholars to join this ministry, is the first Taiwanese Bible jointly translated by both the Catholic Church and the Protestant Church on this island. Hence, its ecumenical significance deserves us to treasure, especially at the moment of the church’s commemoration of 500 years after the Reformation, Rev Tsai remarked.